Back cover blurb: Professor Olivia Sweetman has worked hard to achieve the life she loves, with a high-flying career as a TV presenter and historian, three children and a talented husband. But as she stands before a crowd at the launch of her new bestseller she can barely pretend to smile. Her life has spiralled into deceit and if the truth comes out, she will lose everything. Only one person knows what Olivia has done. Vivian Tester is the socially awkward sixty-year-old housekeeper of a Sussex manor who found the Victorian diary on which Olivia's book is based. She has now become Olivia's unofficial research assistant. And Vivian has secrets of her own. As events move between London, Sussex and the idyllic South of France, the relationship between these two women grows more entangled and complex. Then a bizarre act of violence changes everything. The Night Visitor is a compelling exploration of ambition, morality and deception that asks the question: how far would you go to save your reputation? The Night Visitor is an intriguing novel. Dark, creepy, claustrophobic and gripping but not in the usual way. Professor Olivia Sweetman, Historian and TV presenter has just finished her much anticipated novel. But she couldn't have done it without the help of her unofficial research assistant Vivian Tester. Vivian is a .. peculiar woman, to say the least. The Night Visitor is told from alternative perspectives, those of Olivia and Vivian. Both of them have a story to tell about the writing of "Annabel" a fictional account of one of the first female Doctors, and they are conflicting in their views to say the least. From the outset of this novel it is clear that Olivia has something to hide and that her relationship with Vivian had more to it than just researcher and author, but what is it? 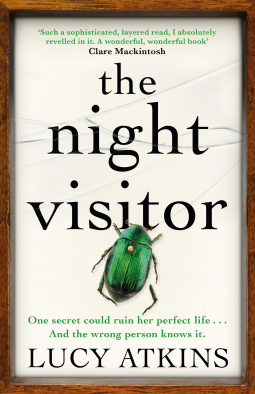 The Night Visitor focuses on the fraught relationships we have with those that we believe that we trust, the complexities and pressures of juggling family life and fame, and the pressures of not wanting to fail. The Night Visitor is available now via Amazon online and all good book shops.